This week we will be checking out a newly discovered dinosaur that was published on just last week! Enter Mosaiceratops azumai! Mosaiceratops was a small, plant-eating ceratopsian dinosaur that lived in what is now China during the Late Cretaceous, between 92 and 78 million years ago. From beak to tail it only measured a bit over three feet long and would have eaten plants. The name "Mosaiceratops" translates to "Mosaic Horned Face" because it had features about its anatomy that are present in more than one group of ceratopsians...like a mosaic...which is made of different kinds of tiles. Mosaiceratops life reconstruction by Christopher DiPiazza. Mosaiceratops belongs to the group of dinosaurs referred to as ceratopsians. The most famous of these is Triceratops, but there were a lot more. Of these beaked and frilled dinosaurs, there is a lesser-known branch, called the basal neoceratopsians. These guys were more evolved than say, Yinlong, which as far as we know is the oldest member of the ceratopsian family tree, but still not in the same specific group as the really large members with huge horns, like Triceratops and Styracosaurus. The basal neoceratopsians tended to be small, could walk on their hind legs or on all fours, and had rather short frills. 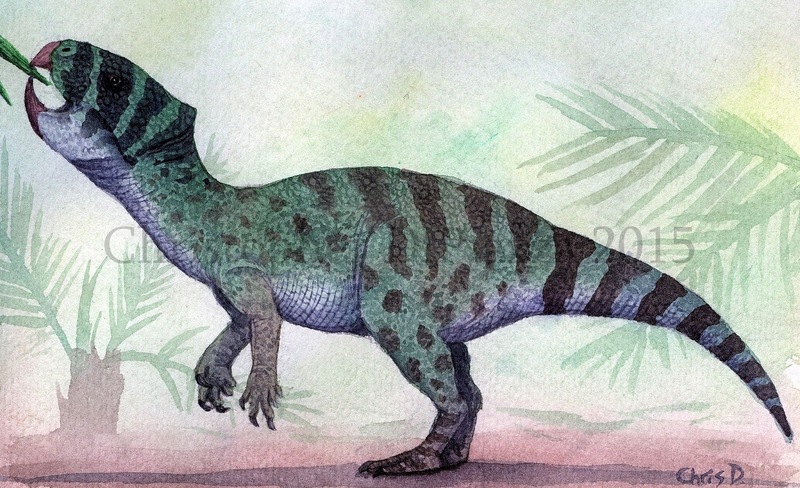 Aquilops is a good example of a basal neoceratopsian. Mosaiceratops, although a member of this group, had some odd characteristics about it still. The most prominent was the fact hat it didn't have any teeth in the front part o fits jaw, just beyond the beak, called the premaxilla. In other members of its group, there are small, pointed teeth present there, possibly to help rake in vegetation easier, but not in Mosaiceratops! In fact, other than the extremely large ceratopsids, like Triceratops, the very early, and more separated group of ceratopsians, called the psittacosaurs, are also known to have no teeth in that part of the mouth. But Mosaiceratops doesn't appear to be one of them, either. This is why it is called a mosaic-dinosaur, or a combination of different traits. It helps scientists map out the evolution of ceratopsian dinosaurs that much more, by making it that much more complicated! Fossil material found of Mosaiceratops. You can see the underside of the jaws in the upper left of the photo. When alive Mosaiceratops would have used its sharp, curved beak to clip vegetation which it would process in the back of its mouth with its small teeth. Its lower jaw was especially robust, suggesting it could bite down extremely hard if it wanted to. It also had relatively long arms, each tipped with five fingers, three of which had claws, which may have aided it in manipulating food, or maybe even digging in the dirt of roots or possibly invertebrates to eat for extra protein. The eye sockets of Mosaiceratops would have been very large, suggesting it had decent vision. Zheng, W., Jin, X., and Xu, X. 2015. A psittacosaurid-like basal neoceratopsian from the Upper Cretaceous of central China and its implications for basal ceratopsian evolution. Scientific Reports 5: 14190.